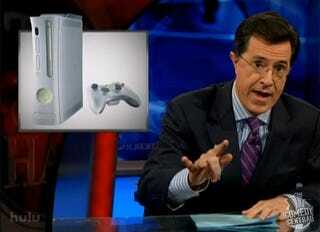 Last night's episode of The Colbert Report featured a special shout-out the Xbox 360 during the Tip/Wag segment. I guess we should thank the Jonas Brothers for bringing it to Mr. Colbert's attention with their public support for the console. Colbert presses the point with a look at a couple of the games that highlight the "family" oriented nature of the Xbox 360 — first with a look at Left 4 Dead 2 ("The family that plays together, stays together."). Then with an examination of the values imparted to players via Grand Theft Auto IV ("Where yes you can pay a prostitute to work your crank. But then you can mow her down with your car to get the money back. That's just fiscal responsibility. ").